You get the following when you buy this product. 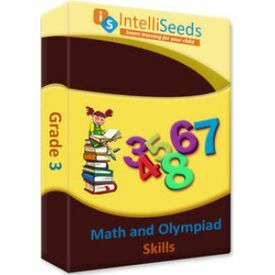 Math Olympiad Grade 3:The best amalgam of practice as well as speed tests, our Math & IntelliAbility combo covers a wide variety of topics covering multiplication, division, geometry, fractions as well as artificial language, direction, age, relation based puzzles, and picture matrices. Mock Olympiads ensuring a wonderful exposure to your young explorer! IntelliAbility (Mental Reasoning) Grade 3: Learning was never so much fun! Help your child build up reasoning skills with our complete brain workout program. We have over 900 reasoning based questions catering to different types of verbal reasoning, logical reasoning, spatial reasoning, and mental ability, computational problems dealing with shadow matching, classifications, direction sense, and mock Olympiad tests.